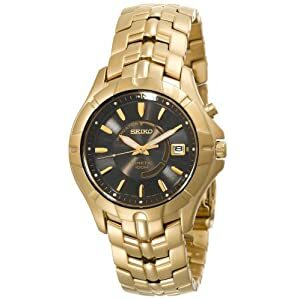 This is a nice looking gold tone watch with an interesting band. The band, case and bezel are all gold colored. The dial is black with gold hour markers and luminous hands - easy to read any time. It has an hour, minute and second hand. The watch never needs a battery because it is a kinetic - it uses energy from arm movements to stay wound up. No manual winding needed. The date is shown in the usual 3 position. Japanese quartz movement for accurate time keeping, and it's water resistant to 100 meters (330 feet). This is a manly watch - big and somewhat heavy. Many guys prefer that to a light and delicate watch.